MTN Nigeria came up with Night data plans, that can go a long way in seeing you through on so many things you can do with data. It could be either; browsing, downloading of musics, Games, video chat calls, chating on social medias with friends, watching of videos online, can be through YouTube and lots of more etc. 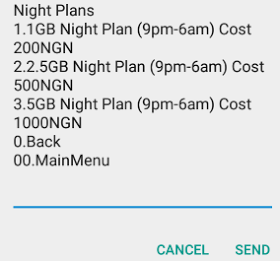 These newly introduced night data plans are very cheap and affordable, as you can get 500MB with N25 only. Are you such that does heavy download that requires much data, this very night plans are just for you to flex. It works on all devices that have access to internet, (be it PC, Android, Nokia, Windows, iphones/ipad, Apples etc) And also it doesn't require any sort of VPN like netloop, psiphon, simple server, droidvpn etc. All you can do is just to subscribe and immediately the data will be active in work for use. How to subscribe to any of the Night plans? ==>2. After the dialing, a pop up will display prompting you to enter a number to continue. Just reply with 2, then next select 8. ==>3. The next thing that should display, will be a list of they night data plans as shown above from the screenshot provided. Then select appropriately the one your airtime can buy or your choice of data. Make sure your airtime is sufficient for any one you are going for. ==> For the MTN 500MB night data plan, although it was released first before these ones listed above. To subscribe for the data, send NIGHT to 131 (starts from 12AM to 4AM) for ₦25 only. Happy surfling with MTN Night data Plans..